Home » Ship's Log » How does Bikers United work? This week I’ve been asked a few times how the site works for people who’ve had their bike stolen. So this is a quick and (hopefully) easy to understand guide. 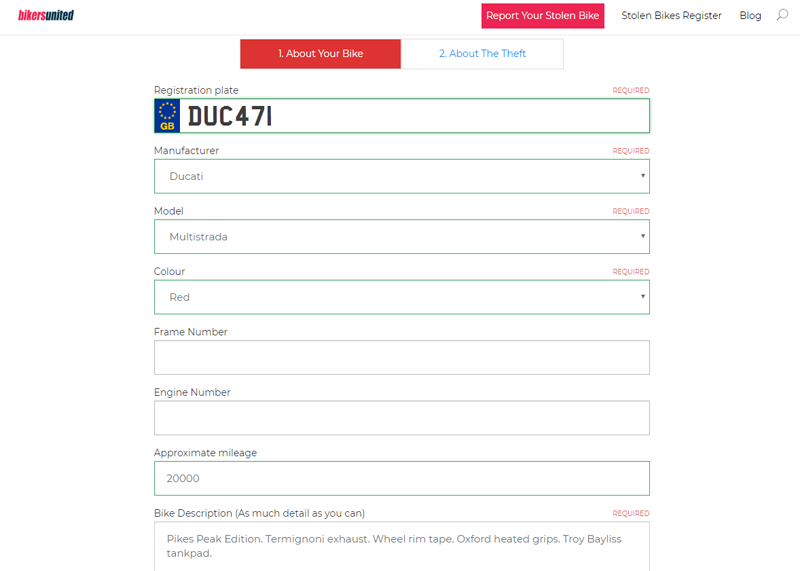 Click on the big pink Report Your Stolen Bike button at the top and fill out this form. It takes 2 minutes. We just need a quick description of the bike and a few details about the theft. 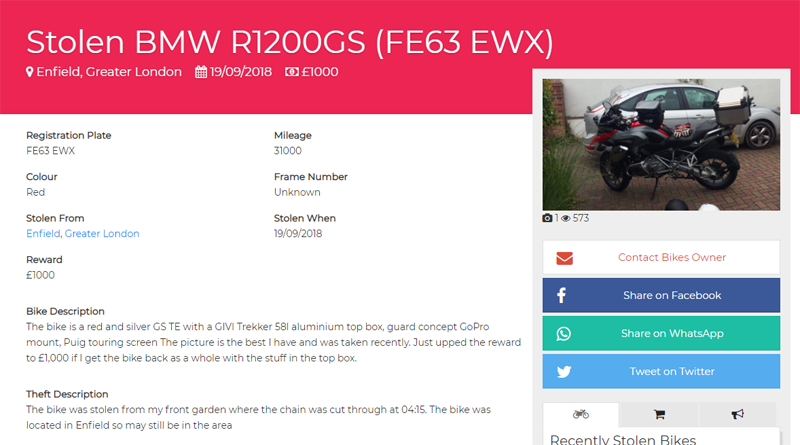 Two minutes later and you’ve got a listing and a fixed link you can share on your own social media channels, just like the R1200GS above. Your listing can be edited at any time; you can add more details, updates on any sightings, more images etc. People can also contact you through your listing if they have any information. Listings get shared on our Twitter and Facebook channels where they get pumped into the feeds of bikers. The above screenshots show the social interactions on this stolen motorcycle listing after 48 hours. The tweet has been shared 10 times and been shown over 900 times to bikers across the UK. On Facebook it has reached over 1,200 people and been shared 14 times. 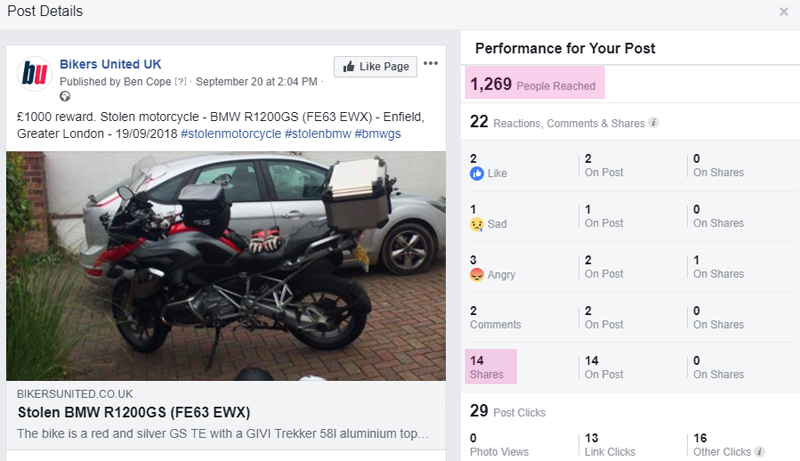 As it gets shared on different profiles, it gathers momentum and gets more views and more shares, which increases the chances of connecting you with someone who has some information on your stolen motorcycle. If I see a suspicious bike, I Google the number plate. 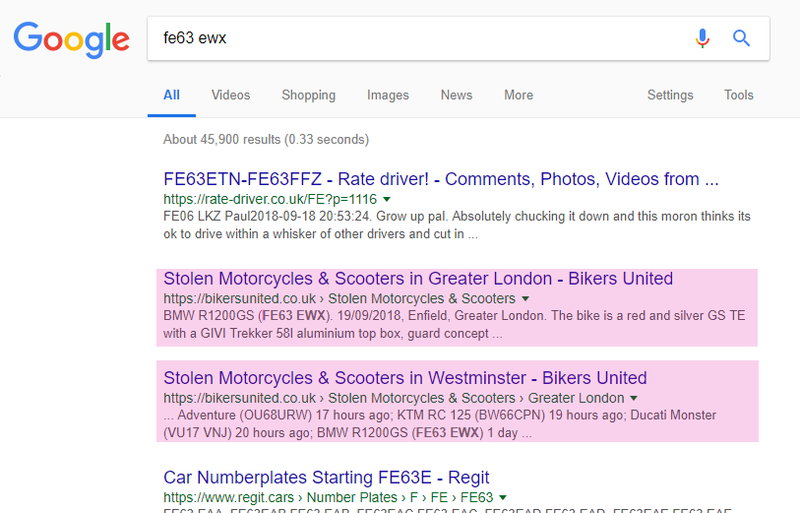 If anyone sees your bike being ridden aroud or finds it parked up or dumped in a strange location, they’ll find your listing if they enter your reg number into Google. If you’ve entered your frame number or engine number and these are entered, they’ll bring up your listing too. While unfortunately most bikes get dealt with, within 48 hours of being stolen, bikes can be found weeks and some times months later. Far more people use Google than social media and if anyone taps in your details, they’ll be able to find your bike and contact you. Your listing can be maintained with our easy-to-use interface. If you your your motorcycle (or scooter!) you can mark it in your profile as recovered and share your story with the community. When you mark your bike as recovered it is labeled on our site so that our community knows. 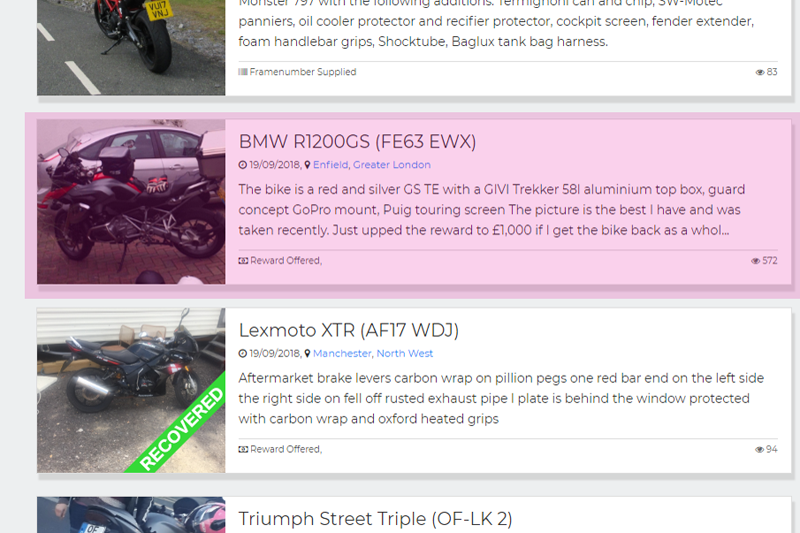 Our Guides section is added to weekly and contains in-depth articles to help you relocate your bike and also secure your bike so you reduce the chances of becoming a victim of motorcycle theft. Bikers United gives you a single point of contact that you can direct people to. You can always be contacted through your listing and you can manage it easily. The trouble posting it on your own Facebook is that you have to open up your profile for people to be able it share it and that means anyone can see who you are and what you’re up to. You don’t want bike thieves being able to go through your social media profile and learn more about you. Also, it is hard to find a post on Facebook once it has disappeared from your feed, so your post will be there one minute, gone the next. Bikers United solves all these problems and keeps your post visible to anyone, by giving you a platform to get your bike infront of thousands of bikers, quickly and effectively without putting your personal details at risk.